Chuck Berry's trademark four-bar guitar introduction and quickfire lyrics reflected the rebelliousness of the youth of the 1950s. He was one of that exclusive group who took rhythm and blues from its black roots and "crossed over" to make it part of most teenagers' lifestyle. He influenced generations of succeeding rock stars, most notably the Beatles, the Rolling Stones and the Beach Boys. Yet he faced major financial difficulties through mismanagement and had frequent brushes with the law. Charles Edward Anderson Berry was born into a middle-class family in St Louis, Missouri, on 18 October 1926. As a teenager he began playing concerts in his local high school but his education was curtailed after he was convicted of armed robbery and spent three years in a reformatory for young offenders. He was influenced by blues heroes such as Muddy Waters and T-Bone Walker, as well as white country and western music, though his singing style owed much to the clarity of Nat King Cole. "My music is simple stuff," he once said. "Anyone can sit down, look at a set of symbols and produce sounds the music represents." His recording career began in 1955 with the legendary Chess label in Chicago, where his first release Maybellene became one of rock and roll's first hits. In the next few years, he scored a succession of hits, all aimed at an adolescent audience, including Roll Over Beethoven, Sweet Little Sixteen, Carol and the classic Johnny B. Goode. His music transcended the colour bar that plagued many contemporary black artists as affluent white teenagers in Eisenhower's America reached out for something new. "I play the songs they want to hear," he said. "That makes them feel they're getting what they came for." He appeared in several rock films including Rock, Rock, Rock and Mr Rock and Roll, both from 1957; Go Johnny Go from 1959; and Jazz on a Summer's Day in 1960. In 1962 he was charged with transporting a minor across state lines for immoral purposes. The girl in question was a 14-year-old from Texas who he claimed he had brought to Missouri to check hats at his St Louis nightclub. After he fired her, she complained to the police. In court, the judge's summing-up was blatantly racist and the trial was eventually declared null and void. His conviction at a second trial and the resulting two-year sentence left him embittered. His release coincided with the rhythm and blues revival in Britain. With his material being covered by bands like The Beatles and the Rolling Stones, his work was discovered by a new generation. 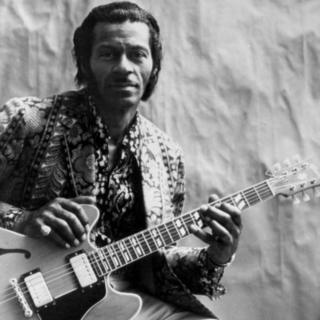 "If you tried to give rock and roll another name," John Lennon famously said, "you might call it Chuck Berry." Successful tours followed. He scored a few more hits with No Particular Place to Go and Memphis, Tennessee. His biggest hit came later in Britain with the atypical 1972 novelty record, My Ding-a-Ling, replete with double entendres. When he wasn't churning out the hits, Chuck Berry was thrilling audiences with his live performances. His trademark became his duck walk, a crouching movement across the stage made during his guitar solos. Offstage, he could be a prickly character, exemplified in the 1987 film Hail! Hail! Rock 'n' Roll which featured a tour with a backing band organised by devotee Keith Richards of the Rolling Stones. In the same year, he published an explicit autobiography genuinely penned by himself. Berry's attitude to money was notorious. He demanded cash upfront for many of his concerts and in 1979, he served a 100-day jail term for tax evasion. There were further brushes with the law. In 1988 he settled a lawsuit from a woman he allegedly punched in the face. Two years later he was sued by a group of women after it was discovered that a hidden camera had been placed in the toilets of his restaurant in Missouri. He also received a suspended jail sentence for marijuana possession. Despite the advancing years, he continued playing one-night concerts and embarked on a European tour in 2008 at the age of 82. In January 1986, Berry was among the first musicians to be inducted into the Rock and Roll Hall of Fame with a citation that summed up his contribution to popular music. "While no individual can be said to have invented rock and roll, Chuck Berry comes the closest of any single figure to being the one who put all the essential pieces together." Berry himself had a simple explanation for his success. "It amazes me when I hear people say, 'I want to go out and find out who I am.' I always knew who I was. I was going to be famous if it killed me."